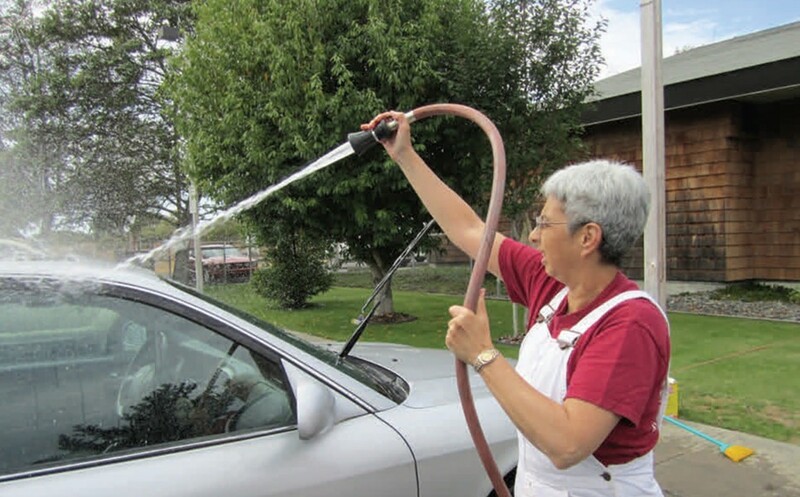 Nancy Dean, meteorologist in charge of the Weather Forecast Office in Eureka, washing cars as part of a fundraiser in 2011. After 36 years with the National Weather Service — 20 of those as the meteorologist in charge at the Eureka Weather Forecast Office on Woodley Island — Nancy Dean has retired. Her last day was today. Nicolini said that, under Dean, the Eureka office took on other nontraditional roles, such as being the first weather service office in the nation to focus on educating the public about so-called sneaker waves (they don’t technically “sneak,” but you can be surprised by them if you don’t pay attention to the conditions in which they occur and don’t know what to watch for). “One of the outstanding categories of accomplishments for the Eureka office has been in the area of marine weather. Nancy's team made significant contributions to the advancement of marine forecasting and product delivery. For example, they developed a first-of-its kind high resolution nearshore wave model that addresses a range of marine forecast issues. These include general wave forecasting where the new technology has cut in half the time needed to produce a forecast that is also superior. This technology has spread through the National Weather Service and is now being pipelined into the standard forecast environment for all offices. This new technology has also supported solutions to regionally specific high impact issues such as harbor entrance forecast development that addresses one of the deadliest hazards in the marine environment. This level of research and development is uncommon from an operational field office with 24/7 forecast responsibilities, and it shows the level of dedication and commitment that Nancy has inspired in her staff. “Nancy's office has also made significant advances in the approach to community preparedness for tsunamis. On the heels of the 2004 Indian Ocean tsunami, Nancy's team embarked on an aggressive approach to preparedness that used drills, tests, and exercises as the primary tool for ensuring that communities would respond correctly during a real tsunami. This was a significant departure from traditional preparedness activities that were based on presentations and written educational material. This approach was tested during the recent 2011 tsunami from Japan and the results were startling. Emergency officials reported that the real evacuations felt like drills because everything went so smoothly and because the public was completely calm. “Nancy has also always believed that NOAA’s line offices should work together to accomplish the overarching goals of NOAA. She tirelessly contributed to the NOAA West team while also looking for ways to support fellow NOAA offices in northwestern California. She has been the driving force in uniting the NOAA of the region and this has resulted in very successful collaborative efforts to support NOAA's National Marine Fisheries Service in their management of migratory salmon.